Born 30 April 1887 in Duck Lane Cottage, Downton, Wiltshire [registered in Alderbury, June 1887]. Attended Sanford Street School and the Theological College, Warminster. According to the 1891 census, the three year old Harold is the youngest of three children to Frederick Henry and Jane (née Cove). They live at 14 Short Lane, Andover. His father is a grocer's assistant. According to the 1901 census, Harold is now just one of two children living with their parents at 8 Market Street in Swindon. His father is now a pork butcher. According to the Great Western Railway Employment Records, Fleming began working as a fifteen year-old clerk at The Engineer's Office, on 20 May 1902. He remained in their employment until 30 September 1907, when he also signed professional forms with Swindon Town FC. According to the 1911 census, Harold, now a professional footballer, is the only one still living with his parents, now at 5 Durham Street in Swindon. His father is a dairyman. The census also reveals that Harold is one of seven children, three had tragically died. According to Passenger Lists, Fleming was one of the Swindon Town team on board the LH Vandyke leaving Buenos Aires bound for Southampton on 3 August 1912. Fleming was injured and acted as the after-dinner speaker. According to the North Wiltshire directory's, as well as Kelly's Directory and the BT Phone Book's, F.H. was still living at 5 Durham Street in 1920, whereas H.J. was now in Wroughton Road. By 1924, he was at 40 Croft Road, while his bootmaking and sports outfitters shop was based at 7 Fleet Street, Tel No. Swindon 284. From 1937, he was still living at Croft Street, whilst his shop was now at 24 Regent Circus. By 1940, he was living at The Knoll (tel no. Swi 2971), and still in his shop and Regents Circus (tel no. Swi 2813). Still available in 1959 edition. According to the 1939 register, Harold J., an athletic outfitter and owner of a boot factory, and Grace remain married, and they live at 40 Croft Road in Swindon, with their daughter Merial. Married to Grace Haskins [registered in Cambridge, December 1918]. They had one child, Merial (b.23 April 1920, d January 1992). Died 23 August 1955 at 1 The Knoll, Croft Road in Swindon, aged 68 years 115 days [registered in Swindon, September 1955]. Left £13,118 4s 11d to his widow, Grace. Height/Weight 5' 10", 11st. 7lbs . Club(s): Played junior football in Swindon, with St. Mark's FC, before having a trial with the town's professional team, and then signed for, Swindon Town FC, after impressing the secretary, Sam Allen, in October 1907. Fleming settled to become club captain and to be an integral part of the team seeking election to the Football League. He missed most of 1912 after an FA Cup semi-final injury at Stamford Bridge, in what was a bruising encounter with Barnsley FC on March 30. After being constantly fouled, he was kicked in the groin and had to leave the field, he did not return for ten months. He returned to fitness, and despite an over-£3000 transfer to Newcastle United FC on 5 May 1914 failing to materialise, with agreements having been completed, he remained with Swindon until his retirement, completing 295 league appearances, scoring 182 goals, in August 1924. Distinctions: Fleming was a man of religious principle, he made a religious commitment to never play on a Good Friday or Christmas Day. Fleming's statue (left) was revealed on 2 May 1956, shortly after his death, scuplted by Carleton Attwood. 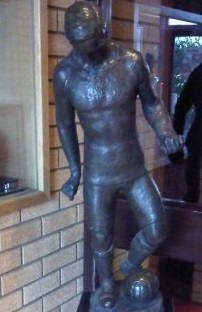 It currently stands within the County Ground premises. Fleming Way (SN1) runs from Swindon's town centre running eastward toward the town's County Ground stadium. Player number 341st player to appear for England. First match No. 101, 3 April 1909, England 2 Scotland 0, a British Championship match at Sports Arena, Crystal Palace Park, Penge, London, aged 21 years 338 days. Last match No. 119, 4 April 1914, Scotland 3 England 1, a British Championship match at Hampden Park, Mount Florida, Glasgow, aged 26 years 339 days. Distinctions The first Wiltshirian to represent England. Fleming became a successful businessman in Swindon. A proprietor of a football boot factory in the town. - An English Football Internationalists' Who's Who. Douglas Lamming (1990). Hatton Press, p.97/98.